Extraordinary preparations are required. The spectator has a guide, and wears booties. 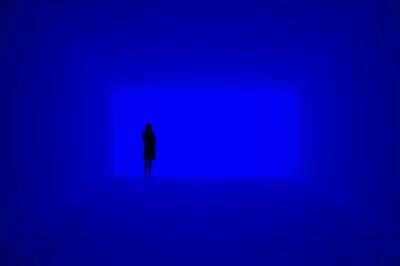 The Ganzfeld conception (End Around, 2006) is a white room with a sort of screen at one end, azure. The wall surfaces, ceiling and floor seem to bounce light rays everywhere, the effect is like fine sparkling haze. The walls are thick but come to a sharp edge at the entrance, framed by a simple lighted arch, or rather a lintel-and-post view. The floor rises to the screen, then drops away (hence the guide). 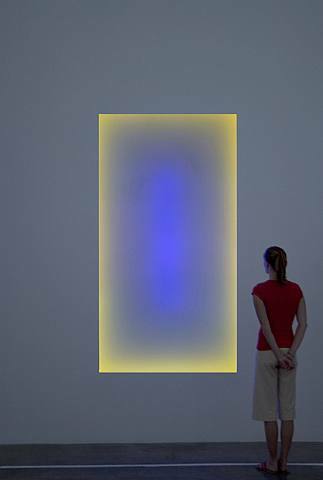 The three Tall Glass pieces fit into a wall, vertical rectangles of light, green, slowly manifesting a violet center, which subsumes the whole, the process repeating with a yellowish tan the color of the shadowed walls, etc. (Gathered Light, and so for Silent Leading and Pacifist Aggressive, all 2006). All of this as minute in its divisions as the changing sky (with reference to Rothko perspectives).